Good morning! 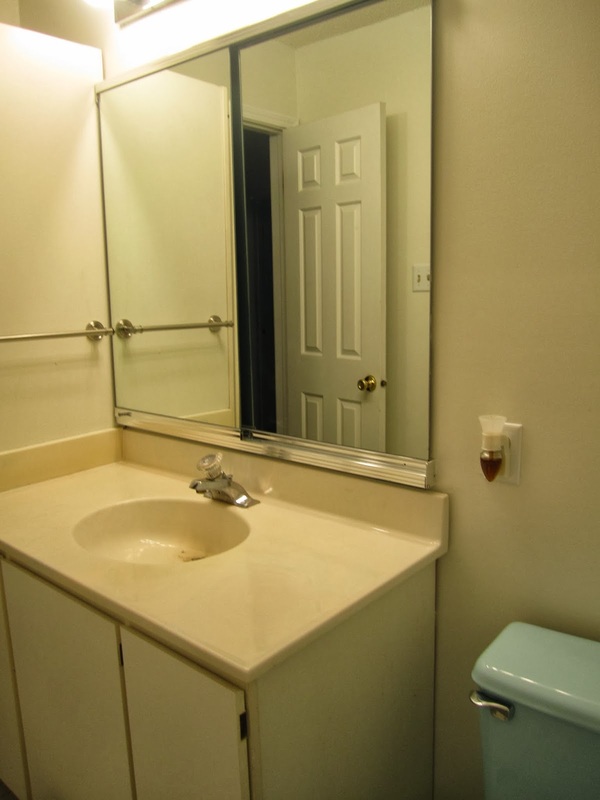 Rainbow bathroom? Yes. But not Rainbow Brite bathroom. 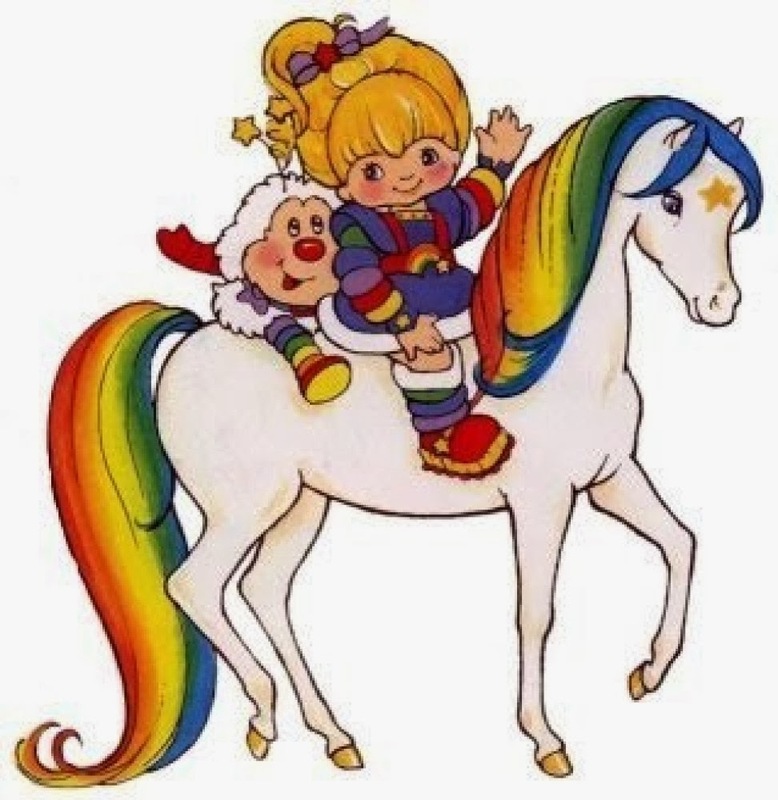 Remember Rainbow Brite? Oh ... I do. I remember her. And I loved her and even her horse Starlight. I confess I can't remember the name of that miniature Fry Guy looking thing behind her. Sprite? Was that his name? 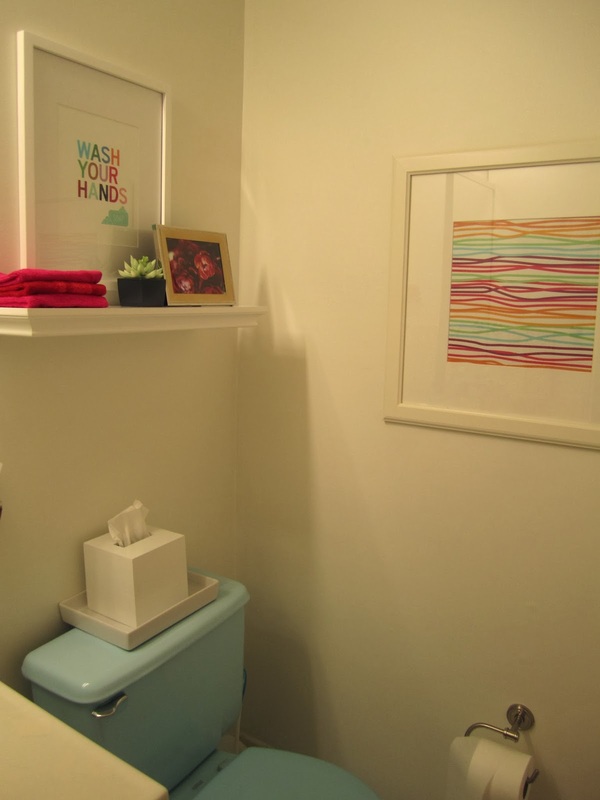 I'm going to move the art currently over the toilet into my laundry room instead. 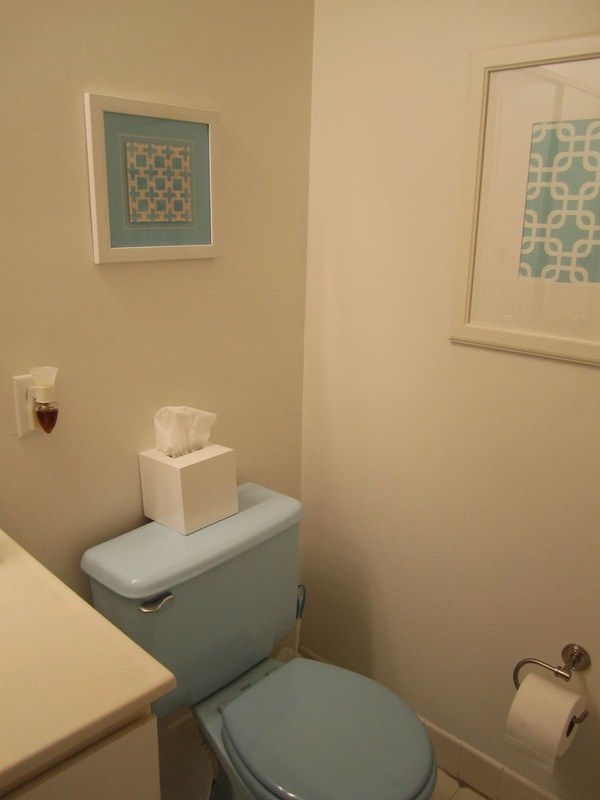 I love that little print, but I think it makes you focus even more on that blue toilet. So if I keep the shelves and contents as white as possible, I'm hoping that will make the area even less blue -- one can dream, anyway. 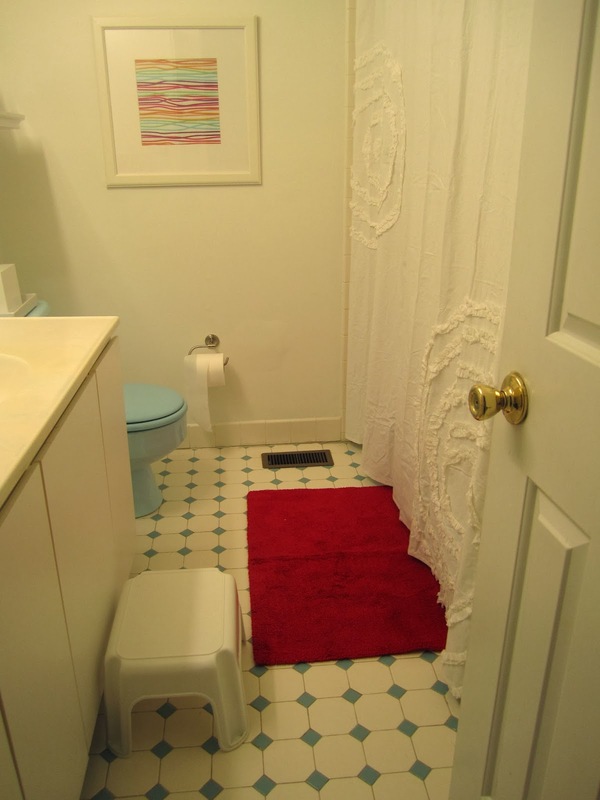 I may even replace the current bath mat with one that is only white and oversized, so it hides the tile. 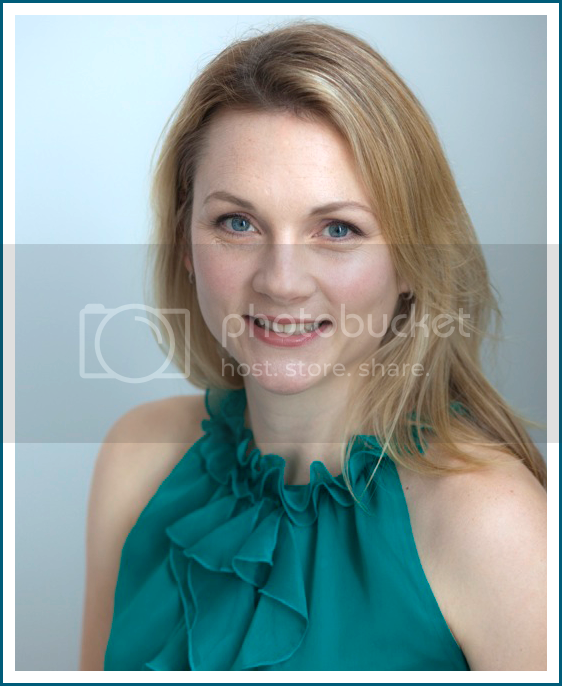 You can see what I'm talking about here in these pictures. 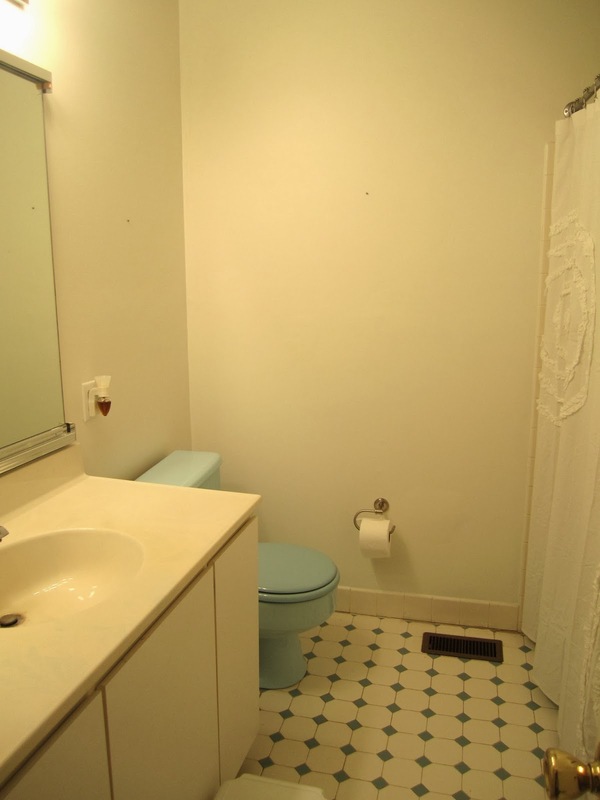 The fixtures in the bathroom are blue - the toilet is blue, the tub is blue and the floor has blue tile. Lots of blue. 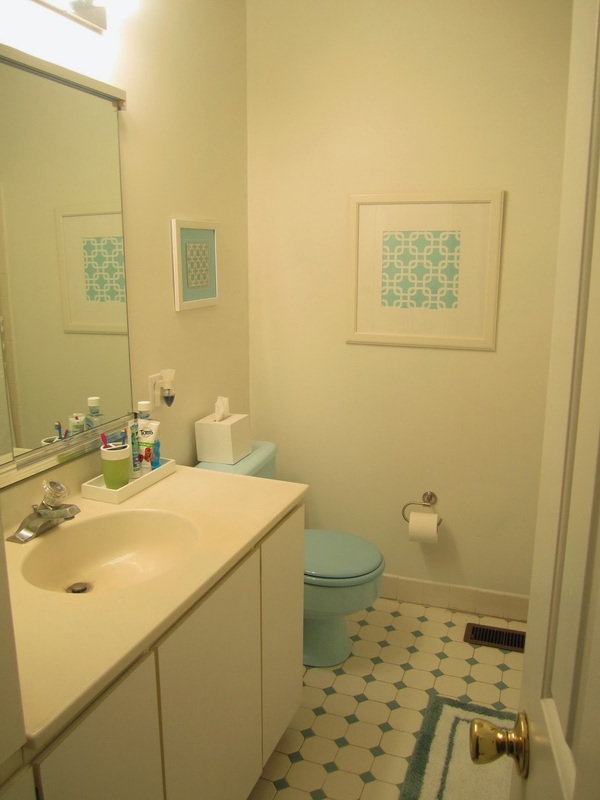 The more I thought about it and the more I took a good hard look at that space, the more I realized two things: (1) no amount of decorating can or will hide the blue fixtures and (2) my use of blue and green in the space actually accentuated the blue fixtures. 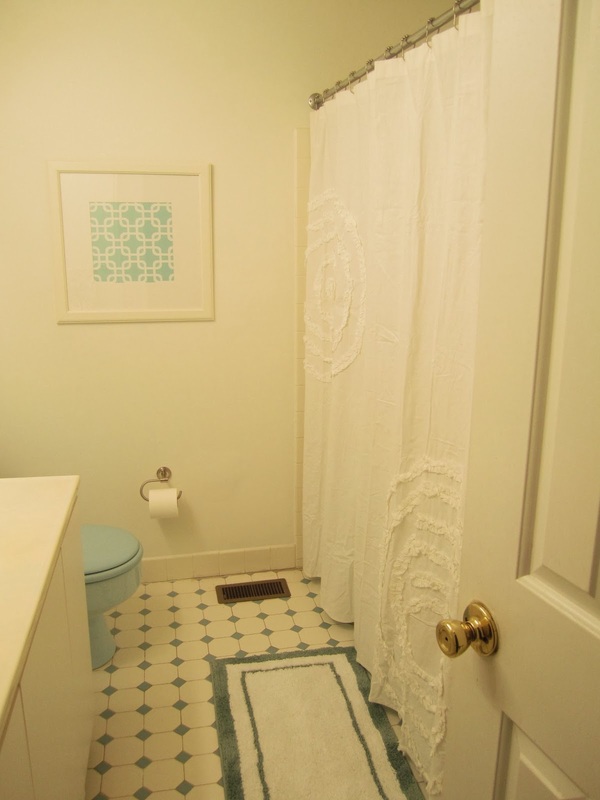 So I took everything out: the art, the bath mat, the accessories, the towels - everything. Ahhhhhhhh ... blank slate. As soon as I saw it, I asked the seller, Baby Bellies, if she could make the background white instead of blue, which, of course, she happily did. Look how cute! I found the toothbrush holder and soap pump on clearance (woo!) at Bed Bath and Beyond. They are, by the way, Kate Spade. Wow fancy. The bath mat was a $4.97 clearance buy from the Pottery Barn Outlet. I wanted something nice and bright and as far away from blue as I could get. Kinda wish I'd bought a second one at that price. I bought the acrylic canister for the kids' flossing things at Target. They are great about flossing if I keep the flossers out, but glass was a huge no-no. This was about $6 and looks like glass but is plastic. The fun patterned bucket thing is a clearance find from the Christmas Tree Shops. It was $.99! 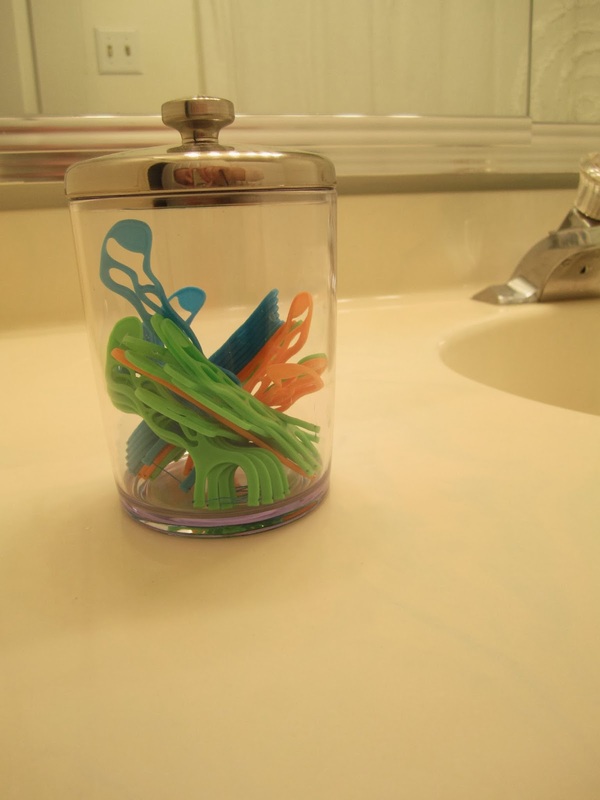 It holds the kids' toothpastes [of course they do not use the same kind] and rinse. I may paint over the print with a solid red or dark pink -- I'm not sure if the print works. But, here's the stuff around the space. I also added a shelf over the toilet. I bought the shelf at Target for about $20. 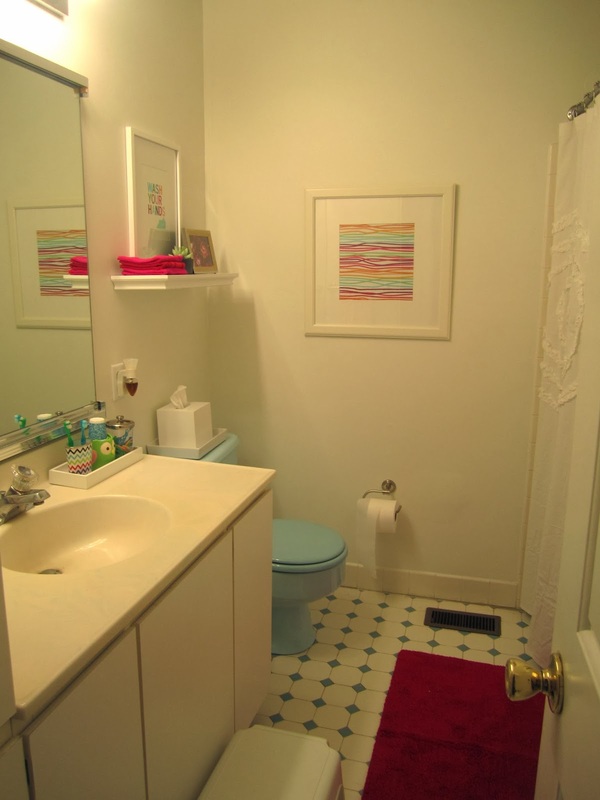 I think the shelf is important in this spot because rather than focusing on the blue toilet, your eye is instead drawn up to the shelf and its contents. Sure, you can see that blue monstrosity, but it's not the only thing you see. Accessorizing the shelf was a ton of fun. I folded up some colorful washcloths on the shelf and brought in a small fake succulent (also from Target). 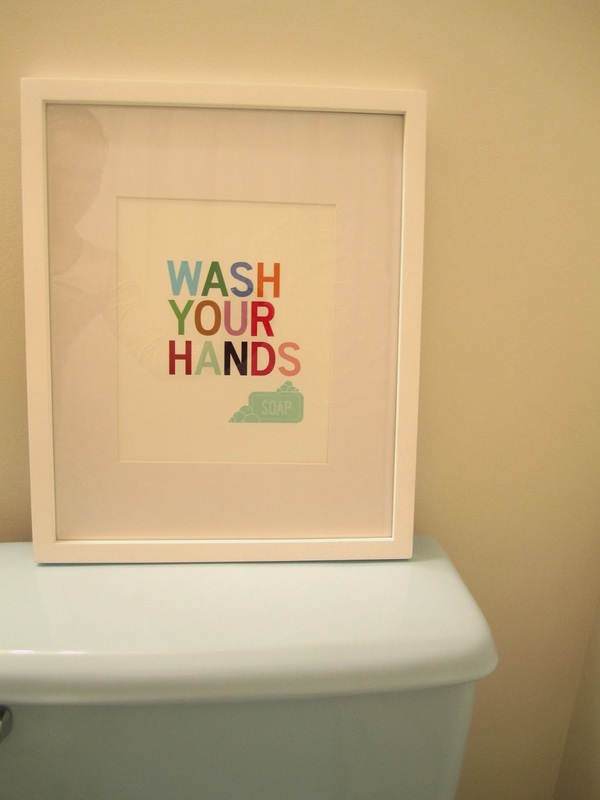 I bought this pretty print from Etsy in reds/purples from Semi Sweet Studios. I liked how, again, it is a totally different color from blue. I bought a white tray from Target for the top of the toilet too. It holds the tissue holder, and I like that it takes the focus off of the blue. The big print on that focal wall in the space had to go too. I love it, but the blue made all the other blue in the space pop out so much. I ended up framing some colorful wrapping paper from Target. I love it! I tried to find a print that fit the frame but could not. 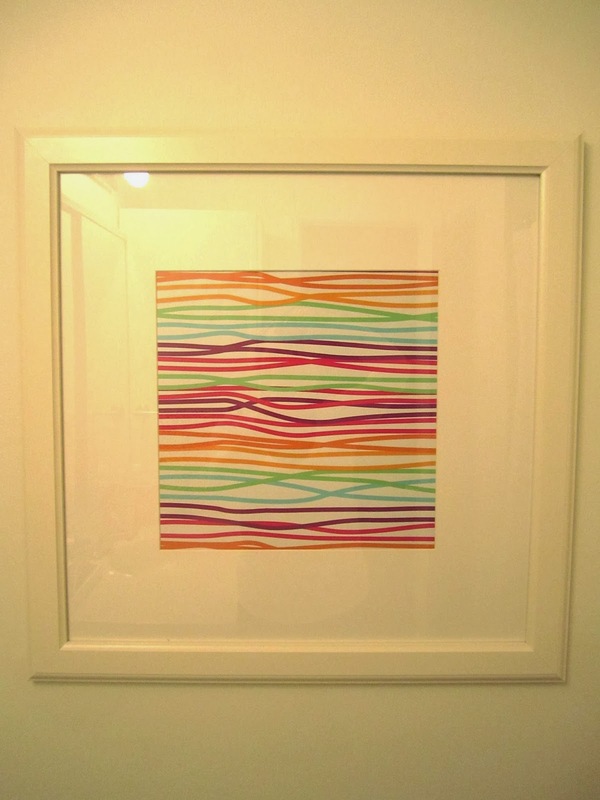 So when I found this entire roll of rainbow striped wrapping paper for about $3, I totally geeked out and threw the roll in my cart and was all "guys, do you understand I just bought art for your bathroom?" and they were all "mm ok cool can we get a toy?" I also bought some new hand towels. Now, ideally, I would have used white towels. 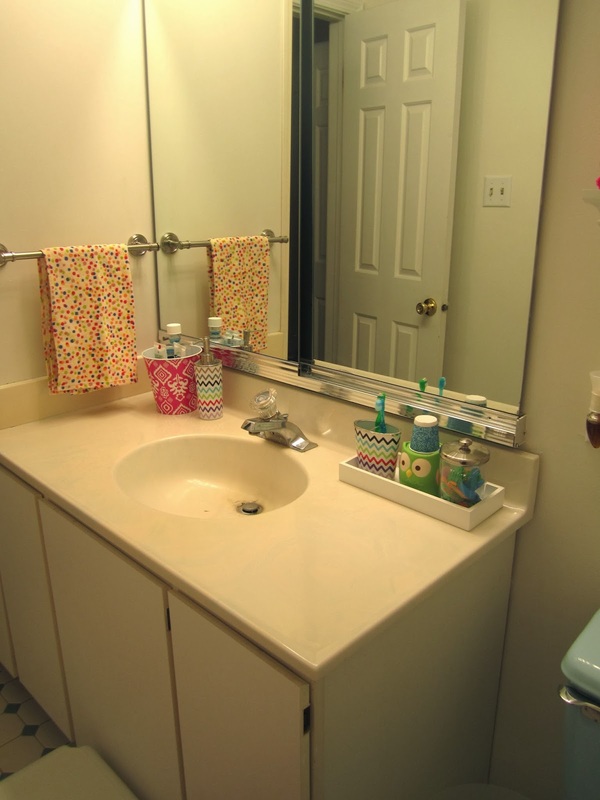 But my children use this bathroom and my children love chocolate and other treats that stain. White is impractical. So I wanted a fun print with all those colors. I could not find bath towels that worked. This was very frustrating. And then I expanded my search to kitchen towels. Ding Ding Ding! Kohl's to the rescue. I managed to snag these cute striped towels and this floral one for about $14 total thanks for clearance and a sale. They are fantastic - super soft and look great in the room! So that is it! What started out as a purely functional redo ended up with a room that I actually love. Here are some before and after shots to close out the post. Yeah! I cannot tell you how happy this changes makes me. 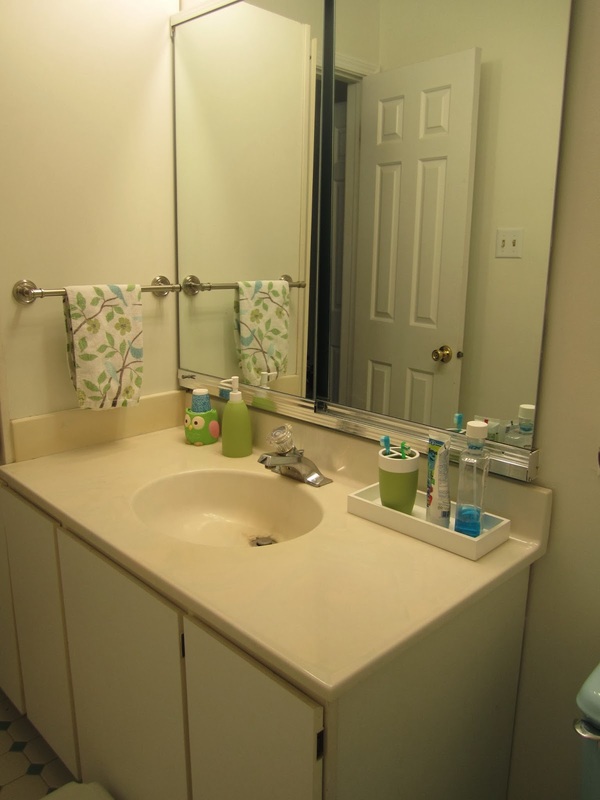 Have you ever stumbled onto a solution for a problem in your home like I did? And do you like rainbows? It looks so good! Love the art and the pops of color. 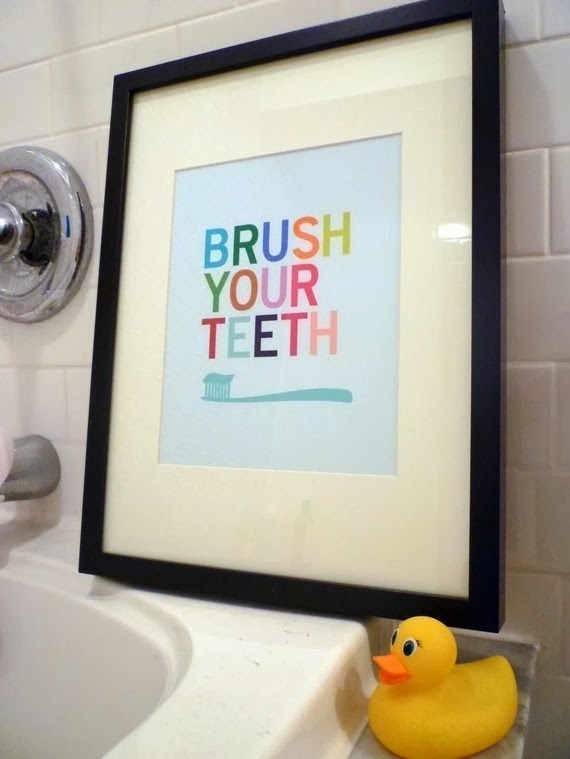 Perfect for the kids' bathroom! The decoration in the house is so wonderful, I like it.